This FM-X tuner is even upgradeable! Cyrus offers only one tuner in its current range, and here it is. It fits neatly into that range both physically and conceptually, claiming fuss-free performance based on traditional sonic virtues, at a sensibly middling price. Most manufacturers generally buy in sub-assemblies for use in their tuners. Cyrus is no exception; the FM-X features a pretty familiar selection of chips for the various decoding functions. But the way in which these sub-assemblies are all used together has a few nips and tucks beyond the basic 'application note' circuit and the neat and efficient layout is also Cyrus's own. 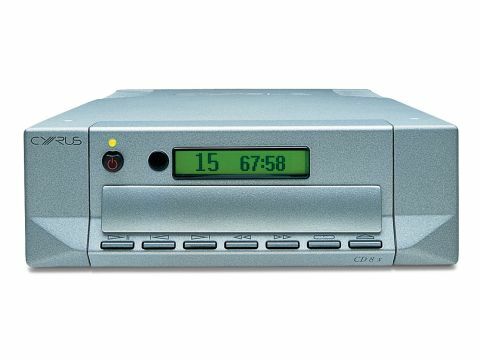 In addition, this tuner offers a truly unique feature in its compatibility with Cyrus's PSX-R external power supply. It's not required for basic operation, but it can be added as an upgrade, supposedly bringing sonic improvements. Other features include fine-step tuning, with 10kHz increments (rather than the more common 25kHz) and seven, one-touch presets. Plus one of the nicest signal-strength meters we've seen in a while, with lots of segments and 'full strength' for once indicating more than just so-so reception. First impressions of this tuner were of a lively and communicative sound, free from any obvious nasties. But, it wasn't until we'd had a really good chance to listen to it under varying conditions and in direct comparison with its competitors, that we realised just how good it is. There are limitations: the treble is not quite as open and detailed as the very best tuners we've heard and stereo imaging depth is likewise slightly compromised. One or two currently available models will give just a shade more insight into really low-level details of live BBC Radio 3 broadcasts and other demonstration-quality transmissions. But that's nit-picking. What we heard from the FM-X, consistently over different music types and in two locations with differing reception conditions, convinced us that it's a lot more than just a pretty face. For a start, it has truly excellent bass. Tuners usually measure flat in the low frequencies but don't always sound it, finding it hard to tread the line between leanness and flab. In this case, we'd say the line is marked out with precision, the sound possessing plentiful depth but never straying into vague woofiness. On the contrary; it's tuneful, clear and that old favourite of plucked double bass is admirably easy to pick out and follow. The midrange, meanwhile, is largely free of colorations with just the occasional trace of perceived lift on female voice, spoken and sung. It's detailed, too, resulting in unusually good imaging - good width and decent depth with it. Cyrus has opted for a fairly low audio output level. But, don't be put off! The FM-X's measured performance underlines the high standard of sonic achievement with distortion that's actually better than the limits quoted for our measuring test set. The frequency response is not the flattest in the group, but it's still only 1dB shy at 15kHz - probably audible in A/B comparisons, but certainly not worrying. Crosstalk performance is exemplary at better than 40dB over a wide frequency range, and noise with a good strong signal is well suppressed, as are the 19kHz pilot tones and the intermodulation distortion that invariably accompanies it. With weak incoming RF, noise does climb somewhat and it's evident that this tuner is not optimised for marginal reception conditions, but if that's the price one pays for excellent audio performance we're happy to accept it.